This is the latest book I’ve read by this author. He has been very prolific and is quite the expert in Egyptology. I’ve read at least 6 of his books. Found this one in a book store by my doctor’s office. One needs to really, really be interested in the topic of Egypt to read this as there is a lot of repetition within it…but then, it really is complete. 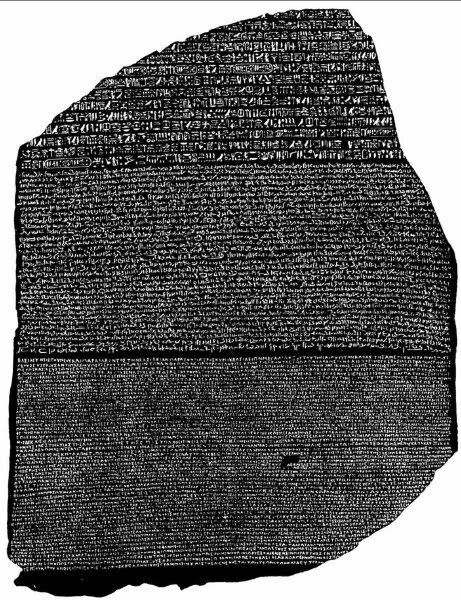 The subject of the book of is the Rosetta Stone, so named as it was found in the ancient place called “Rosetta”. It was found by the French during their invasion of Egypt and surrendered to the British after their defeat. It carries 3 separate and not quite identical bodies of text related to Ptolomy V (203 – 181 BC). It was critical to the decipherment of hieroglyphics. The book gives a detailed history of the stone, which of itself is worth the price of admission. The inscriptions, in Greek, demonic or Coptic or New Egyptian and hieroglyphics, are all translated in detail. In addition, several other copies of the same document (document in stone?) are known and these are translated as well…..this is what makes for all the repetition…but then it is thorough. The text itself is of interest as to what it says about a peoples regard for a decent ruler. The author also give some of the history related to the efforts to gain an understanding of hieroglyphics which was interesting. In the field, there is a bit of controversy related to the contributions of Thomas Young and Jean-Francois Champollion and the competition that existed between them. Champollion is generally credited with the final success. What is debatable is the amount of Young’s work that was essential to his efforts. Champollion gave Young almost no real credit for his success and Young thought he was instrumental and given no due credit for the discoveries. This author appears to lean toward Young’s side in the argument.